The former 11-story, 35,000 sq foot Hotel Astor, was located in the Times Square area of Manhattan. Upon its opening in September 1904, it dazzled guests with its enormous public rooms, and exquisitely decorated themes. Located in the area bounded by Broadway, Astor Plaza, West 44th Street, and West 45th Street, the hotel was demolished in 1967. The New York Press Club was founded in 1872 as a center for journalists. 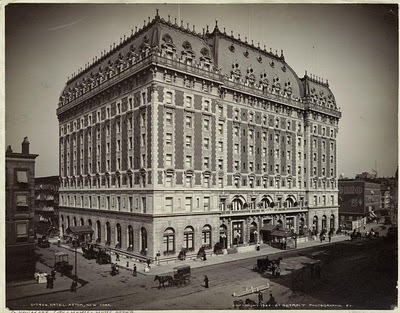 The Hotel Astor in 1904 shortly after its grand opening. The Society of the Genessee was founded in 1897 by Louis Wiley who had been a newspaperman in Rochester and became the editor of the New York Times. It consisted of descendants of pioneer families of the Genesee Valley. The Wisconsin Society of New York held its annual banquet at the Hotel Astor on February 28, 1906. The Society was comprised of former residence of Wisconsin how were residing in New York. 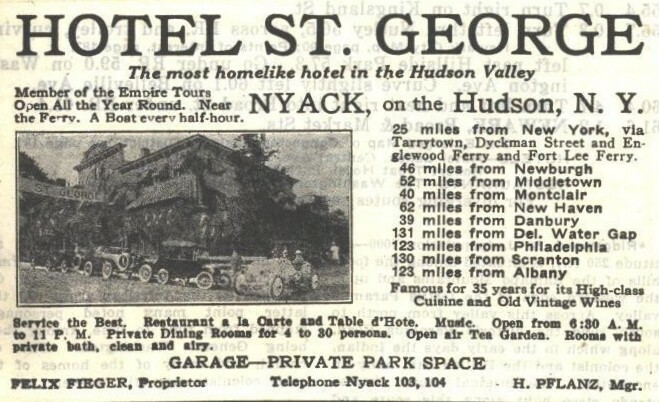 George Bardin opened the Hotel St. George on Burd Street East of Broadway in Nyack, New York in 1886. The hotel and its restaurant were the first stop for many travelers from the boat landing on Burd Street to the interior of Rockland and beyond. Although it no longer operates as a hotel, the building where the hotel was located still stands today. The New Reilly (also known as Reilly's Hotel) was operated by Hugh Reilly at 410 West Franklin Street in Baltimore. The exact year the hotel first opened is unknown. The Reilly family appears to date back to the 1870s as operators of hotels in the city. An August 3, 1889 New York Times entry states: Bernard Reilly of Reilly's Hotel, who made a deed of trust on Thursday for the benefit of creditors, has left the city and is not likely to return. It is said he owes about $5,000, of which $1,425 is for rent due for the hotel premises. It is stated that Reilly did not leave empty handed, but that he had about $10,000 in his possession. The hotel was closed up yesterday. It is not known what relation Bernard Reilly had to Hugh Reilly or when Hugh entered the hotel business. 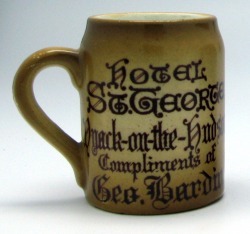 This mug commemorates the annual Elks Convention held at the hotel in 1916. The Russell House opened on the former sight of the old National Hotel on September 28, 1857. The founders were William Henry Russell and William J, Chittenden. Since its inception, Chittenden partnered with a number of different individuals. He continued to be associated with the hotel even after his retirement and up to the time the hotel was closed and torn down to make way for a new and more modern hotel. In October 1907, the Pontchartrain Hotel opened on the sight of the former Russell House. The Standard Club has been recognized as one of the most prestigious private city clubs in the country. It has been an integral part of Chicago's business elite and fashionable society since its founding in 1869. The Club is revered as one of the city's civic treasures--an organization whose incomparable prestige and principles have attracted the city's business, cultural and charitable leaders for generations. As prominent business people, professionals and community leaders, the club's members share a common bond of charitable, social and civic responsibility. 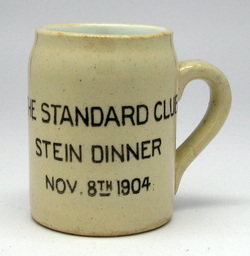 From 1869 through 1889, the Standard Club was located on the corner of Michigan Avenue & 13th Street. It then relocated to Michigan and 24th Street from 1889 through 1926. From 1926 to the present, the it has been located at 320 South Plymouth Court. Harry Slocomb Bond was a very successful restaurateur and hotelier who was born on May 11, 1871 in Shirley Village (Shirley), Massachusetts. Since age 17, Bond worked in the hotel industry, and at 21, moved to Hartford, Connecticut where he became a clerk in the United States Hotel. He later served as assistant manager at the Elm Tree Inn, and soon after, partnered with Mr. Ryan, the Inn's proprietor, to open a restaurant at No, 232 Asylum Street. In or around 1893, Bond purchased his partner's interest assuming all responsibility of the restaurant for the next nine years. In 1902, Bond opened another restaurant, the Harry Bond Restaurant at No. 734 Main Street at the site of the old Mattie Hewens billiard parlor. It became one of the largest restaurants in the state consisting of a dining room, café, rathskeller, Kaiser Keller, and banquet hall. Bond organized the Hotel Bond Company in 1912 and constructed a six-story hotel at No. 320-328 Asylum Street called the Hotel Bond which opened the following year. Bond later leased the Dillon Court Hotel and changed its name to the Bond Annex. Continuing with his success, he purchased the Hotel Sherman and real estate east of the hotel in 1919, and by 1920, owned and operated the Hotel Bond, the Bond Annex, and the Bondmore, all in Harford. A twelve-story addition was erected next to the Hotel Bond in 1921. A lavish grand opening at the hotel was marked by the sound of trumpets and great fanfare. Bond greeted guests in the lobby wearing a tuxedo adorned with pearl and platinum buttons. Harry S. Bond died in 1935, but the popularity of his hotels lived on under different management into the 1950s when increased competition found business lagging which eventually led the Bond estate declaring bankruptcy. The property was purchased by the California-based Masaglia Hotel chain, which incrementally renovated the building prior to selling it in 1964 to an unsuccessful investor. In 1965, the building was sold at auction to the Roman Catholic Archdiocese of Hartford. The Archdiocese converted it into the home of the Saint Francis Hospital School of Nursing (1967 to 1990). It later used the building for meetings and other programs, and leased out space to the Sports Science Academy in 1997. The Bond Ballroom reopened in 2001, and in 2006, the building was revived as a Homewood Suites by Hilton thus keeping the properties legacy as a hotel alive. Postcard of the Hotel Bond prior to its twelve-story addition. During the late 1880s or early 1890s, William Loomis purchased land on Mt. Tom in Holyoke, Massachusetts, to create a resort destination for weekend travelers. Loomis planned to build an amusement park called "Mountain Park" along with a mountaintop restaurant and hotel called the "Mt. Tom Summit House." The Summit House was completed in June, 1897, a month after the completion of the Mt Tom railroad. On October 8, 1900, the "picturesque" Summit House caught fire and burned to the ground. The blaze was said to be the "most brilliant spectacles seen in this section since the burning of Mount Holyoke college." The fire could be seen for miles "in spite of mists and rain." The loss from the fire exceeded $25,000. The Pauly House and Annex was a hotel and restaurant started by the Pauly Brothers in Burlington, Iowa. The Annex was considered one of the most exclusive cafes in Burlington, according to the 1904 Railroad Trains-man Journal. It is not known if this hotel had any relation to the "Pauly House" in Minneapolis which was operated by James Pauly. Postcard view of the Schlitz Hotel (far left) and the Palm Garden (center) during the early 1900s. Interior view of the Palm Garden. The Schlitz Palm Garden, located near the corner of N. 3rd St. and what is now W. Wisconsin Ave., was at the turn of the 20th century, Milwaukee's premier entertainment destination. Opened in 1896 next to the Schlitz Hotel (a separate standalone structure), it was billed as the grandest and most opulent beer hall in the world. It sat 450 people and was very spacious with a high arched ceiling festooned with lights, a pipe organ, and stained glass windows which heightened the glow of colors from the rich oil paintings hung along its walls. The Schlitz Brewing Co. spared no expense to promote Milwaukee and "The beer that made Milwaukee famous." "When the Schlitz Brewing Co. sets out to do a thing, it does that thing well. This is evident in Milwaukee in more than one enterprise, not the least of which is this magnificent and original place of entertainment. While the company has invested millions in brewery buildings and other grand undertakings ... it has contributed more than its share toward the upbuilding of the artistic and beautiful for the enjoyment of the people of Milwaukee, in the erection of the Palm Garden. Nothing in the way of architecture in Milwaukee, so far as public or semi-public institutions are concerned, can be compared to this. There is nothing like it in Milwaukee, nor anywhere else in the United States, for that matter. Milwaukee not only has the best beer in the world ... but it has the grandest place in which to drink it that can be found. "Any visitor to Milwaukee hereafter who fails to see the Palm Garden will miss one of the sights of the town." The Palm Garden flourished until 1920 when Prohibition was imposed. Schlitz tried briefly to keep it open, serving food and soft drinks, but its days were numbered. It closed in 1921 and was converted the following year to a short lived motion picture theater called the Garden Theatre. The theater continued to operate through the early 1960s, and in 1963, the former Palm Garden was torn down to make way for a bank and parking lot. Those buildings were then demolished in 1980 to make way for a mall.